Derek Jeter is back at it today in pursuit of 3,000 hits after the game against Tampa Bay was rained out last night. The postponement left him two hits shy of the milestone, with two games remaining on the homestand. The Yankees began a 1:05 p.m. game today. The two sides disagreed about rescheduling last night's game -- the Yankees said they didn't want to play a traditional doubleheader today, instead proposing a day-night doubleheader. The Rays voted that down, and the sides finally agreed on Sept. 22, a mutual off day that followed a two-game series between the teams in New York. "I don't think there's really a win," Rays star Evan Longoria said. "I think we all know why they'd like to get these three games in and obviously they're rooting for Derek to get his 3,000th hit here in this series. I mean, we'd like to see him do it, too. And he's got two more days to do it." After that, Jeter gets a break. He pulled himself from next week's All-Star game to rest his injured calf. "Unfortunately, I won't be able to go," he said. Later, as showers, lightning and thunder hovered over the ballpark, two teams that don't really like each other too much bumped again. Most of their scrapes have come on the field. This time, a scheduling conflict. "Whether I'm frustrated or not, it doesn't matter," Yankees manager Joe Girardi said. "It was important to us, it was important to our fans." The sides play afternoon games today and tomorrow, with Rays aces David Price and James Shields starting. Jeter is at 2,998 hits and those are his last tries at home before the All-Star break. The Yankees begin the second half with an eight-game road trip. Jeter has a large throng of family and friends in town and desperately wants to make history with them in attendance. He's trying to become the 28th major leaguer to reach the mark and the first to do it with the Yankees. In mid-afternoon, Jeter played amateur forecaster while bad weather approached the area. "Green is not as bad as yellow," he said, looking at the map. The colors conspired against him, however, just as the strained right calf that recently put him on the disabled list will prevent him from playing in Phoenix next Tuesday. Teammate Alex Rodriguez also will be absent from the All-Star game because of a sore knee, and closer Mariano Rivera will miss the showcase because of a tender right triceps. Girardi said Saturday that A-Rod is trying to decide the best course of action -- he could try to play through it, or have surgery and miss a month. 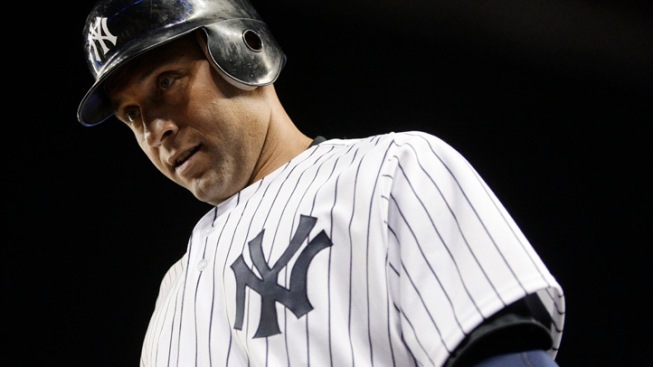 Jeter is a 12-time All-Star and was elected by fans to start at shortstop for the American League. Girardi said it was totally Jeter's decision to skip the festivities. Jeter said he talked it over with Girardi, Cashman and trainer Gene Monahan. "It's probably best not to push it because it's most important to be ready for the second half. That's where my focus has to be," Jeter said. "It's unfortunate because you know how much I enjoy going to All-Star games." "I'm trying to be smart about it. I know I can be stubborn a lot of times with injuries," he said. Jeter is in a 4-for-18 rut since coming off the DL this week. All of those at-bats came with him at the top of the batting order, and he had been set to bat second last night. Brett Gardner was moved to the leadoff spot and Girardi said it was meant to spread out the lineup with Rodriguez and Nick Swisher (left quadriceps) out of action. The extra rest certainly helps the older Yankees, not that they wanted a break with their captain on the cusp of a major moment. To them, a split doubleheader was fine. "It's fan friendly, it's Derek Jeter friendly, it's team friendly," Cashman said. Countered Longoria: "As far as both teams go, it's not real smart for us to play a doubleheader. It stretches guys out. It doesn't give opportunity for a couple of teams to rest who are banged up and just play one game and then another one." Rays manager Joe Maddon took a similar view. "Where we are right now, if I had my druthers about it, we would probably choose later. At this point in the first half guys are run down," he said. "I like the idea you have expanded rosters in September."